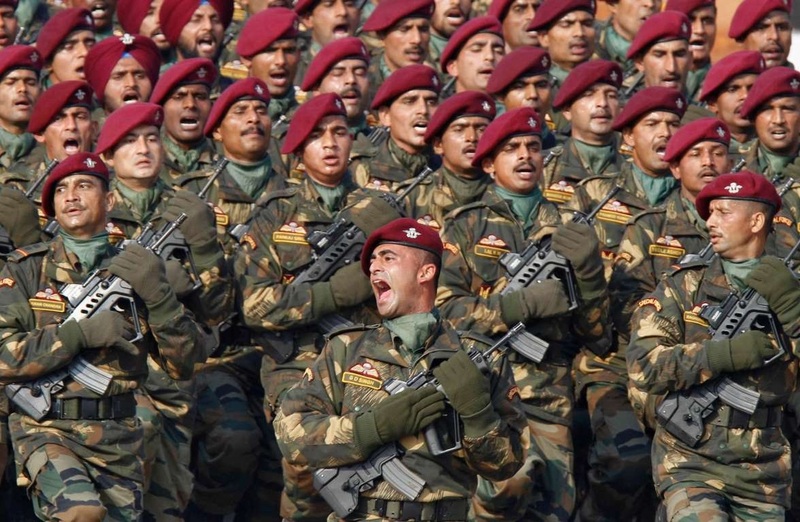 India plans to decrease its 1.2 million strong army men count into lower than seven lakhs, to keep the army have more fire power and less operating cost. Defense minister Parrikar said this in last Friday, Minister also said that it also increase the firepower of the armed forces, who currently lack modern weaponry and communication systems. Earlier, National security adviser Ajit Doval also mentioned the same during a seminar. He also said the armed force operating costs exceed than the modernization budget, hinting the armed forces pay and allowances cost more than half of the budget while new acquisition and maintenance costs below 40%. which poses slow speed of modernization and new acquisitions. After the defense budget allocation in this financial year, many military analysts said that It's important to downsize the soldiers numbers to increase the armed forces fire power. and It's a good outcome from the defense minister who also acknowledged that "army will identify in the regiments and division in which it has the unproductive manpower and it's extent. What he also mentioned about the Army is, It's currently moving into digital technology, it's better to cut down the size of telephone operators. Army also plans to identify it's manpower situation in all divisions and produce a report, in which area they need more numbers of troops and where do they keep less number of troops. Earlier, China announced that they were going to cut down nearly 3,00,000 troops from it's active service while PLA looks to induct more mechanized infantry than the light infantry who having less firepower but more mobile. Indian Army also has such light infantry, Sikh light infantry is one of them, who mainly used for ambush and mountain warfare. India is not going to cut any of its regiments, however, plans to shrink the size of the battalions, each infantry battalion has more than two thousand soldiers, which having soldiers, support troops, special operation troops and mortar support group. The defense minister also said about the lack of officer's in the army, more than a million size army having only 36,000 officers. in Air force, the officers number is in very bad shape, Air force also requires more technical staff's too. As per military point of view, This would be a welcome decision, that modernization programs will be accelerated and Soldiers can be modernized in very quick time, as for an information each INSAS rifle costs around nearly 40,000 rupees, and they don't have any side arm's, personnel GPS locator's, and lack of ballistic vests too. If defense ministry managed to cut down the troop numbers by half from the 1.2 million numbers, It would be better than expected. It's clear that having some smart soldiers are far better than thousand's of normal conventional soldiers. While India also in plans to raise another 80,000 strong soldiers with dedicated fire and air support elements, each division supported by dedicated artillery's and light tanks, along with better transportation supports from IAF's C 130J. This new soldier looks almost ideal to the US army's regular infantry. and they will face the Chinese threats in the arunachal region.